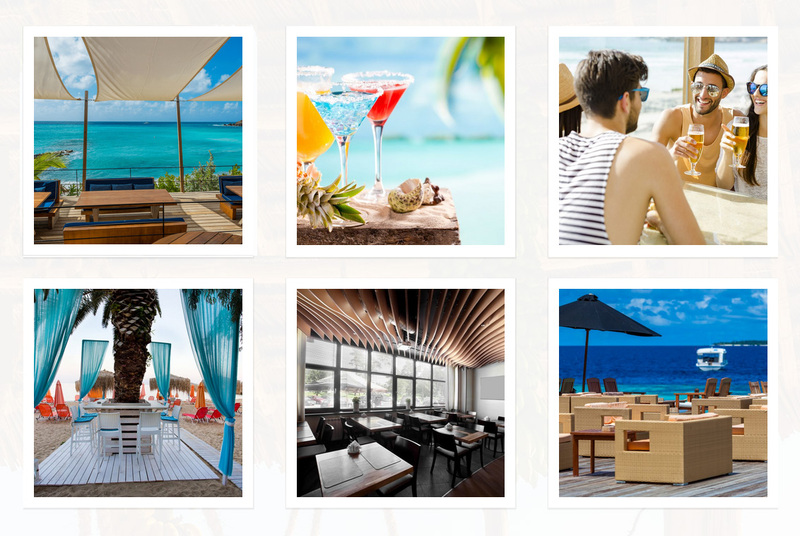 BeachClub WordPress theme is fresh and versatile template. It is ideal for snack-bar, beach bar, club also for hospitality business. Great for all business website presentation where the focus is on nice large background images. 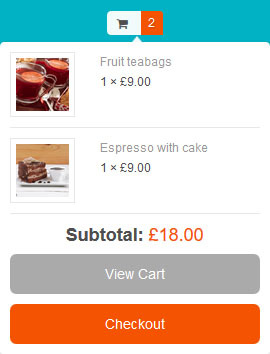 You can use side widget areas to promote your products, events or special offers. Very special AIT element is Food Menu. 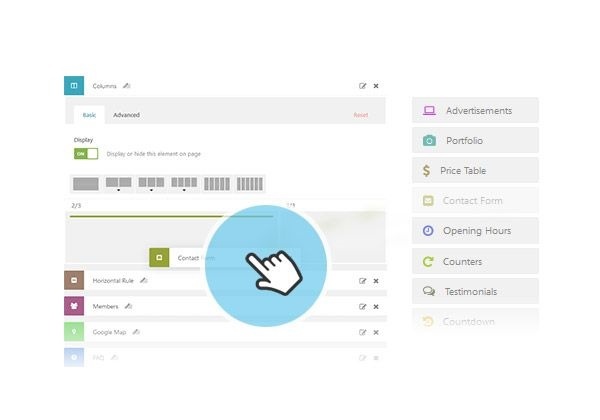 30+ elements, sliders, tabs or opening hour make your presentation highly professional. - New: Content preview of Elements in Page Builder. You can have brief look what will Element look like on frontend when you are working in Page Builder. First multilingual WordPress themes with integrated multilingual system and language translations. You can have your website in any language or create a multilingual website in multiple languages. Theme is ready to use right out of the box. Everything is already translated. Just type in content in your language and it’s done. Theme is fully compatible with WooCommerce shopping cart plugin, special styles included. Theme frontend and administration is already translated to 28 languages. No more PO files. No additional plugin required, no WPML plugin necessary. Theme is multilingual out of the box. New era or website administration. Intuitive for beginners, powerful for advanced users. Everything you'll ever need for your online presence is already included in the theme. Theme is fully responsive from desktop and laptop screens through tablets down to mobile devices. You can configure every part of your website from the admin panel. No HTML&CSS needed. Colors, backgrounds, logo, images - everything can be configured in few clicks in the admin panel. SEO Tools are nicely integrated into Page Builder. No 3rd party plugin required. Website elements are designed to make your work as simple and fast as possible. You can pre-define settings in Default layout section and use them anywhere. Information you set in Custom Types can be easily re-used on any page, no need to type it again and again. Are you only starting your food delivery business or do you already have your company running? Our WordPress theme will help you grow. Take your business online today, it’s that easy. Selling online was never that cheap and simple as today. You don’t need to waste your time building custom made website, integrating shopping cart or getting everything translated. Everything is ready to use right away. You only need to add your logo, images and texts. Using WooCommerce shopping cart plugin you can sell anything you want. It’s the most popular WordPress eCommerce plugin. You can sell physical products, services or affiliate products. You can also sell virtual or downloadable products if you want to. Administration panel allows you to manage your stock, shipping options, taxes or payment methods. It’s an easy to use and very powerful tool. There are many free or paid add-ons that you can install to extend your online store. Your food can be categorized into categories. 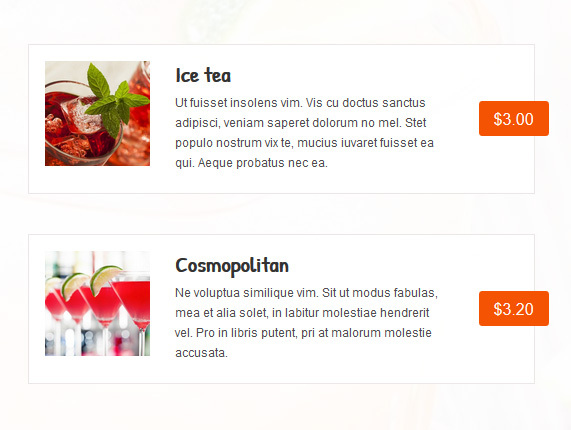 You can use widgets to add special offers or adverts to your subpages. 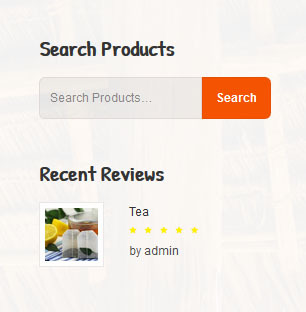 You can easily show top selling products, top rated or recently viewed products. Filters come as standard. Watch statistics and other marketing tools to reach your business goals. You can also connect your shop with your blog, show your company insights or upcoming new products. All these things will help your visitors decide whether they’ll buy or not. Give them all what they want. This WordPress Theme together with WooCommerce are making your online delivery business come true. Customers on your website can quickly add the product to shopping cart right from the list of products. They don’t need to click on product detail anymore. Shopping cart content is shown on any page after you click on cart icon. You can also show it on it’s own dedicated page where you can add or delete products. You can also go right to Checkout page. While adding your products to the system you can use handy “Duplicate” feature. It’ll save your time significantly. Each product can have it’s own main presentation image, image gallery, detailed description and also product reviews. Useful can be also up-selling and cross-selling your products that will allow you to offer your customers additional products that are related to selected ones. Each product can also have it’s own Inventory, notes or menu order. It’s not a secret that we also eat with our eyes and usually even if we’re not hungry and we allure to buy a nice looking tasty food. Nice images are therefore very important part of your presentation. You can use Portfolio element and make an interesting presentation of your products. You can tell a story, or even write a recipe. If you offer services like catering it’s an ideal way to show your customers what you can do. What can you do with this element? You can add a main presentation image, create an image or video gallery. Add detailed description and structured blocks of texts. You can categorize your portfolio items. Portfolio can be added almost anywhere simply using drag&drop in the Page Builder. You can control how many items to show, and even create a filter. Display food and drink menu using Products element. 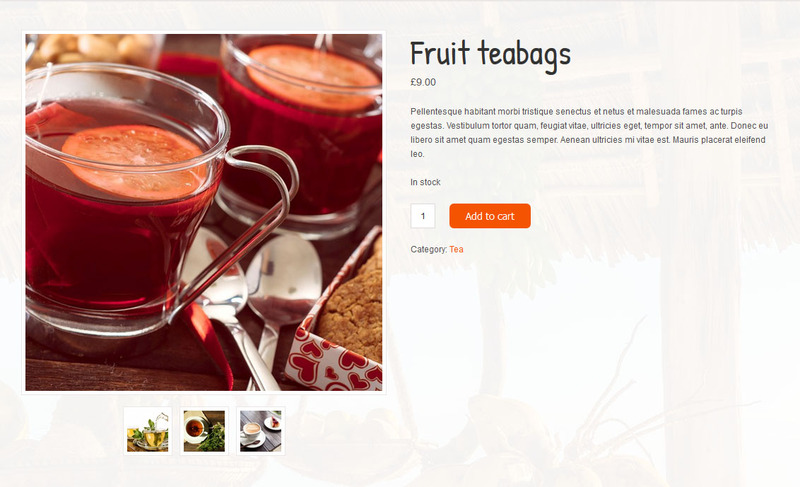 You can add a product image, description, price and product featured flag. Organise products into categories like Soft drinks, Hot drinks, Wine, etc.. Products element will help you present what you offer in nicely. You’ll create a professional looking presentation extremely easily. Product item can be added very quickly, you don’t need to configure whole e-commerce solution. You can show products almost anywhere on your website. Customer can make an order using the contact form that will be sent to your email. Intuitive for beginners, powerful for advanced users. Everything was made to make your life easier. Write your content and focus on your core business. You don’t need to be a web designer to compose a nice looking website. We’ve done this work for you. All themes are Responsive and work perfectly on mobile devices. All our themes come with built in multilingual support. Admin panel & Page Builder is fully translated to many languages. 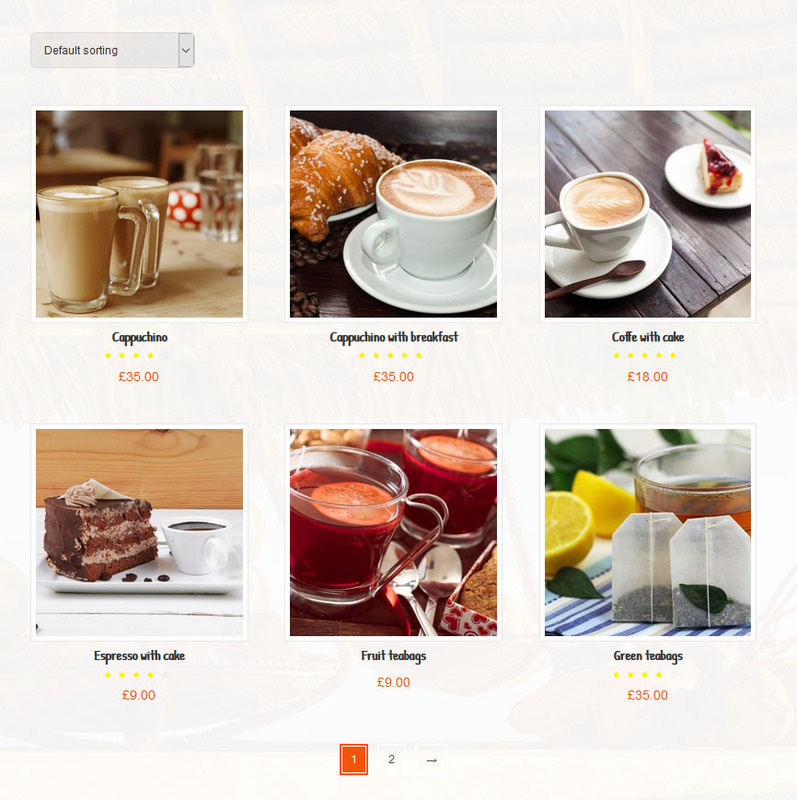 All themes also support WooCommerce plugin. I love the design of mobile application theme. I am thinking of creating mobile application for my company’s website . Here is the official website – http://essaydune.com/pay-for-term-paper/. It has been developed recently so it is simple in design, but I would like to have better design for mobile application. $75 for the theme but do I have to pay that every year? Meaning every year I have to install the theme again? Thanks for your compliments and interesting in one of our products. can you please suggest me any good theme from your database for this website : http://www.worldworx.tv/learn-how-to-make-money-online/ its looking very dull, not attracting users. what is the difference between free and paid version of themes? Our technicians can answer most efficiently even as quick as possible when you decide for priority question (obviously within a few hours). Hi there, is it possible to have the BeachClub’s menu stay at the top of the page no matter what? If so, how can i change that? Thank you. I have a full membership account. Recently, I installed the beachclub theme on WordPress 4.9.6 and I’m working on Chrome 67.0. The theme does not seem to behave correctly, neither in the admin backend nor when rendered. It was installed with a .zip upload and was correctly activated. No other plugins are installed. The rendered theme is full of broken image links, and the backend behaves as if without any styling. The page builder does not load, and any changes made in Theme Admin panel are not saved. Is it a problem with my installation or is the theme not supported on the specific WP version? thanks for asking. There shouldn’t be troubles with the previous wordpress CMS version. Anyhow, please provide our Ait-Themes team with AIT SysInfo report: https://www.ait-themes.club/wordpress-plugins/ait-sysinfo/. Our technicians are ready to help you with any theme-regarding issue: Customer Support is provided during working days from 8am to 5pm Central European Time. If you have not created Ait Themes Club account yet, please use this form: https://system.ait-themes.club/join/tf and post your technical question directly in our support ticket system. Please log in to your account https://system.ait-themes.club/support/ . In general support covers mainly finding of solutions for problems in theme and help users use the product, if there is a bug we’ll fix it as soon as possible. Unfortunately we are not capable working on user’s custom websites.